Galaxy’s Edge magazine is entering its fifth year of publication boasting some of the most stellar writers in science fiction and fantasy and a new Chinese language edition for mainland China. While the magazine regularly publishes stories from the top authors in the field, one of its core functions is to highlight newer authors. 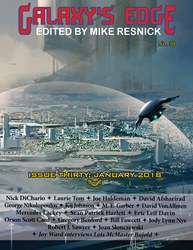 Galaxy's Edge magazine (edited by Mike Resnick) starts the new year with a bang, its latest issue featuring a fascinating collection of stories and authors including Orson Scott Card (author of Ender’s Game), Joe Haldeman (author of The Forever War) and Mercedes Lackey (author of the Valdemar series). The magazine also features an interview each month, and the current issue has an interview with one of the most popular and decorated authors in science fiction, Lois McMaster Bujold (author of the highly popular Vorkosigan saga). Ms. Bujold has won five Hugos and a plethora of other awards with multiple New York Times bestselling books. The magazine’s regular columnists now include Gregory Benford (winner of the Nebula and John W. Campbell awards) and Robert J. Sawyer who not only has won the Nebula, the Hugo and the John W. Campbell awards, but was also named a Member of the Order of Canada in 2017. Past issues of the magazine have included writers like George R.R. Martin (Game of Thrones) and Larry Niven. Galaxy’s Edge was the first to publish a hitherto unpublished (outside of the Virginia Editions) story by Robert A. Heinlein. The magazine is available in paper and digital formats from most online stores and is also (as of this writing) offered free for online viewing at http://www.GalaxysEdge.com. According to the Publisher, Shahid Mahmud, Chinese language rights to the magazine have recently been sold to the Chengdu Eight Light Minutes Culture Communications Company for publication within mainland China. He also emphasized that while the magazine regularly publishes stories from the top authors in the field, one of its core functions is to highlight newer authors. The magazine pays pro-rates (or better) to all its writers and is an approved venue for short stories according to the Science Fiction and Fantasy Writers of America(SFWA). Galaxy’s Edge is an independent magazine published by Phoenix Pick, the science fiction and fantasy imprint of Arc Manor publishers.